Jim Tortorella has a new coaching job. St. Anslem College has hired the former Colby coach. 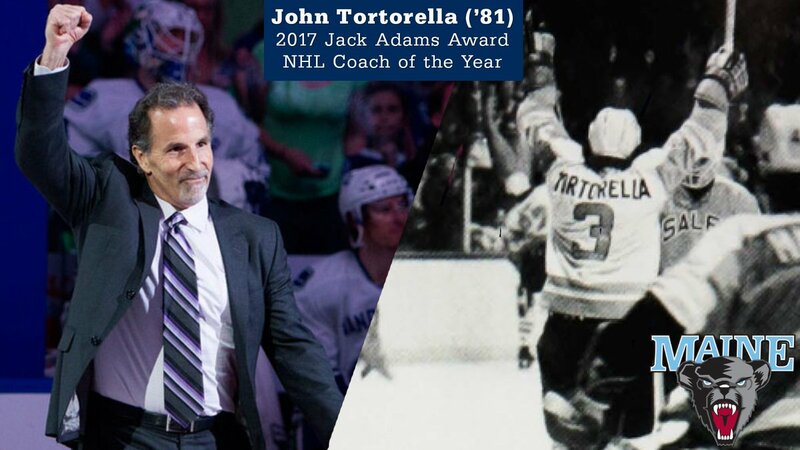 Tortorella spent 16 years at Colby and then went on to be an assistant at UNH and Providence. Before that you may remember Jim as a goalie for UMaine. He’s one of the guys that helped start hockey at UMaine in the late 1970’s. Jim Tortorella now the head coach at St. Anslem. Lisbon native Greg Moore, who played professional hockey for 10 years after a four-year career at the University of Maine, has been hired as an assistant coach with USA Hockey’s National Team Development Program. According to a USA Hockey statement, Moore has been brought in by new head coach Seth Appert. He will be an assistant with the National Under-17 team. Meanwhile, midfielder BC has committed another top player from the 2nd basketball league ProA: after Kruize Pinkins (Hanau) also Till Gloger will strengthen the promoter to the upper house. The 24-year-old and 2.04-meter power forward comes from the Uni Baskets Paderborn to Weißenfels, where he signed a one-year contract. Former UMaine big man Till Gloger has signed a one year deal with…. Translated to English… the Central German Basketball Club. They play in Germany’s first tier league Basketball Bundesliga. Gloger averaged 14.5 points per game last season for Uni Baskets Paderborn in the 2nd division. ...As Zrebiec mentions, the Ravens have a good track record at finding undrafted talent at defensive lineman. Just last year they found Michael Pierce who had a great rookie season. That is why the Ravens front office is considered one of the best in the NFL. For them, the draft never ends after the last pick. Hard Nose talent the Ravens love. At 6-3, 285 pounds Ricard definitely has the frame for a defensive lineman. Add that with his hard-work mentality and the Ravens could have a very good player. A lot of these undrafted players come in with a chip on their shoulder because they didn’t get selected. We see this especially with players from smaller programs. They don’t get the same looks as all the big schools. Former hockey Defenseman Dan Renouf won the Calder Cup last night as a member of the Grand Rapids Griffins, the top minor league affiliate of the Detroit Red Wings . OTTAWA, Ontario - Dan Collins showed some significant promise in his senior season at the University of Maine, and now, it's paying off with a pro contract in North America. The Ottawa Redblacks announced Wednesday the New Jersey-native had signed a contract with the squad, becoming one of six quarterbacks competing for a roster spot. Collins will aim to make the team before opening day Aug. 10. He also joins former UMaine teammate Sherrod Baltimore on the team after Baltimore signed up north back in April. TOM: Thanks for posting this. Always thought that Til Gloger was underrated and under used in his 4 years at UMaine. Didn't get anywhere near enough offensive touches in either his years under two different coaching regimes. Great to see him doing so well in Germany and now into the top League there for next year. His playing time diminished some his senior year and that was disappointing to me. Rap on him was his defense. However, why Maine didn't play their 2-3 zone when he was on the floor was a mystery to me if he wasn't up to the defense that the coaching staff desired. He had the best scoring average per minute play his senior year and only he and Lamar Harewood had plus points per minutes played if I remember correctly. Always looked lime a very coachable player and could find the open man when he was double downed on on the block. My kind of player. Five months after being fired by the New York Islanders, Jack Capuano has a new coaching job. Capuano, a former University of Maine defenseman and Bangor resident who was deposed by the Islanders in January, has been named an associate head coach with the Florida Panthers, the team announced on Friday afternoon. The native of Cranston, Rhode Island, will join the staff of newly hired head coach Bob Boughner.